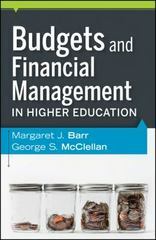 Budgets and Financial Management in Higher Education 1 Edition In today's challenging economic climate, college and university administrators need reliable financial advice for helping their institutions thrive. Thoroughly revised and updated, this book is designed to help new administrators understand and become more proficient in their financial management role within the institution. Written in an accessible style, so that the book's guidance is immediately useful, the book is grounded in the latest knowledge and filled with illustrative examples from across all types of institutions. This is an ideal resource for courses in graduate programs in higher education leadership and administration.